. . . [an] even more serious problem was that neither maps nor aerial reconnaissance photos verified whether the little trail that ran south out of Vossenack to the divisional front, and then dropped down into dank pine forest lining the gorge of the Kall River, actually continued on to that stream. If it did, was bridge in existence there? No one could tell. Maps and photos showed a road of sorts rising south out of the gorge toward Kommerscheidt, through that half-moon shaped settlement, and on into Schmidt. Were the trail from Vossenack and the road through Kommerscheidt connected? They did not know. If so, in what condition was the trail? How wide was it? How firm was its surface? How much had recent rains affected it? How much traffic could it bear? How well was it defended? Maps and photos supplied no solutions to these questions, and General Cota ordered no patrols sent out on reconnaissance missions to provide firsthand information and real answers. Patrols are dangerous missions and suffer disproportionate casualties. Germans in the Germeter-Hiirtgen area were exceedingly sensitive to such American probes. Such assignments, however, are essential if a commander needs information about the enemy he faces. Cota was negligent in not insisting upon thorough and regular patrols that could have supplied much of the knowledge he needed. His reticence to do so ultimately cost his division far more lives than would have been lost on patrol duty? 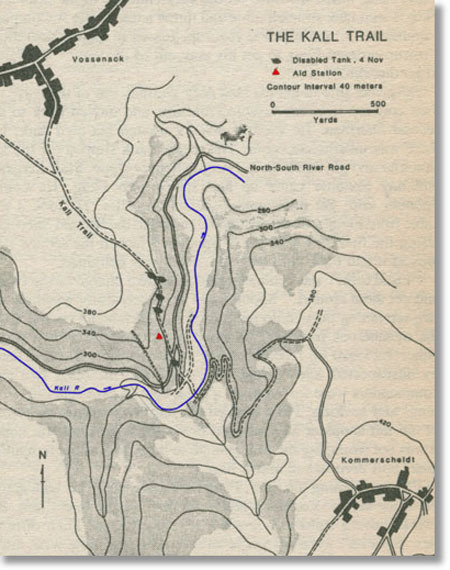 In an incredible move, General Cota designated the inadequate path of the Kall River trail as the main supply route (MSR) for the resupply, movement, and maneuver of an entire infantry division. Inadequate in good weather, it was nearly impassable in bad even for tracked vehicles, yet it now became the lifeline for men of the Keystone [28th Division]. Cota's decision would play a major role in the coming disaster. Because of the trail's shortcomings, once GIs started down the precipitous slope of the Vossenack ridge, the battle for Schmidt would become primarily an infantry conflict. 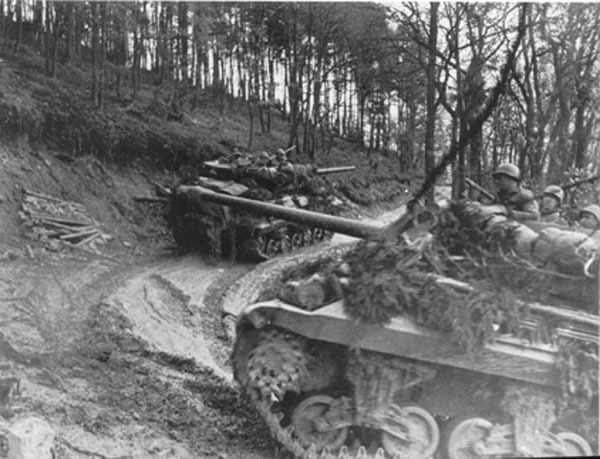 Riflemen could not count on tank support in their assault on Kommerscheidt and Schmidt. It therefore became even more imperative that Ninth Air Force assume responsibility for protection of the 28th's infantrymen south of the Kall. Its IX Tactical Air Command would have to interdict any German armored counterattack. Planes would have to isolate the battlefield. That, in turn, would depend upon the vagaries of weather. Recent forecasts called for more of the same: cold, damp, rainy days interspersed with snow. The Schmidt sector sat in a weather trough, and unless conditions changed rapidly, IX TAC Air would fly very few sorties on behalf of the 28th Infantry Division.